goldsmith in Valenza, comments a famous print of '500 that truly reproduces a lab of that time. To bring back to light the traces of the past we need to dig out, reconstruct the pieces found, identify it's production time, the civilization to which belonged, determine the dating and so on with complicated and sophisticated operations. To the contrary "archeological" researches on a goldsmith lab of the past could be done with out any problems, because we would find with surprise that most of the tools used by today's goldsmith craftsman are the same of the ones used, for example, in a Renaissance workshop. There is a reason. Today's craftsman, like yesterday's, doesn't look expenses and production times, but only to express in an object his creativity and his manual experience. For the craftsman it isn't necessary to rationalize the production through new tools - like it's instead vital for the industrial products- because this would deprive him of his extemporaneous creativity. In time, the craftsman improved or invented new tools to produce in series some parts of the product or to contain the expenses shortening some phases, but for every piece of work is still considered indispensable at least a final elaboration " by hand" with the most traditional work tools. Tools that often the artisan built himself, that modified and adapted to his specific necessity, shaped to obey to his gestures, to his "skills". Tools that with time became part of the craftsman itself. In the most used tools of the goldsmith usually are evident the wear out parts, that reveals particular working habits: wood handles -for example- with hollows left by the hand that used them until it left its prints. And the sharper the print is the more that tool is irreplaceable because the adaptation is by now physiological and between the hand and the tool it establish a kind of symbiosis.The old tools show the signs of the constant, loving restoration to extend its life beyond every limit, and the goldsmith if changes lab will bring them with him like irreplaceable personal equipment. Our tour begins from the environment that constitutes the lab, which has a very high vault so to allow a constant air volume despite the presence of flames to weld or the fireplace for the fusion. The workbench is arranged in a way to get the maximum luminosity from a big window so to avoid that the artisan casts his shadow on the table. 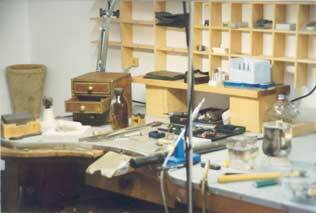 The very solid workbench is placed on a wood floor, excellent to recuperate fragments and gold dust. The most important tools are hung all over the walls. The window, open on top as an air hole but closed at the bottom to avoid ill-intentioned visits, has hanging a balancing scale (basaculla, in archaic Valenzan) fit to weight those things that Cellini used to call "grosseria" or better to say those objects of certain dimensions like, for example, silver chalices and candelabrums. We can notice also a huge chain with a medallion; objects that - as it shown in most of that period prints - are often wore by the Renaissance Lords. The scale and the big chain with every probability made "store window", or to show to the passing persons the kind of work they were doing over there. The lab entrance was probably on the side of who observes the print, and opened directly on the street. Let's go on the goldsmith workbench. To the left we notice the traditional stool, called in Valezan "tabuart" (a curious Gallicism) which differs by the actual only because it has three legs instead of four. Detail of the print of Etienne Delaune, kept at the British Museum of London. It allows us to see the labs of that period. The old "stocco", due to the many hits show really deep abysses. From the workbench it hangs down a cloth, fixed to its extremity. This is the precursor of the "tola", the drawer tin-lined where it's collected the file dust of the processing and the various gold fragments. The cloth, well fixed to the workbench, was used as an apron to form a pot under the "stocco", excellent to collect a little of everything. On the side of the cloth, tied to the cord there is the traditional the "piutì", that no Valenzan goldsmith doesn't know, even if from a decade it has been substituted by the more prosaic black bristle brush. It's the "little paw hare", which is used to clean the workbench and collect the file dust. It's short hairs, thick and resistant, don't leave back any fragment. On the table are laid some engravers and a shear; in the front of the artisan on the right we note a hand scale, such as the ones in use today even with the advent of the electric scale. He is engraving a drop earring with an engraver, and it's singular for the strange glasses that the print author gave him. The same thing is doing the artisan in front of him, while the third is mounting a gem in a jewel fixed on a spindle, which is laid on the "stocco". It's surprising to observe how the hammer, that has to be of a certain weight and shape, it remained also unaltered in time. Beyond the artisan, an apprentice "the garsunì" assigned to the less demanding jobs. He's pulling a thread in the draw-plate. Nothing new under the sun, we've got it too, but only that modernism wants that we use a more prosaic handle instead of that strange wheel. On the side and on top of the "garsunì" (another Gallicism of our dialect) hung in the wall, deformed prospectively so that it can be distinguish the kind of "morsel", there are two flat files and two half-round files, suitable for the different processing. We notice also a plate with several holes for pulling the thread, two clamps, the same at those still in use, several tongs and some pitch spindles. On top some recipient to contain the acids and the liquid residues. There are also two mortars and two filters. But are we really in a lab of 1570, or Mr. Stefanus that signs the print (Stefanus fecit in Augusta 1576) is a goldsmith in Valenza's old town? At the left of the big window we notice again two big pitch spindles, two hand drills, the same as the one on the workbench and still the same to the ones in Valenza until a few years ago, before the arrival of the power drill. But some old stone setters won't despise still today, for particular jobs, the hand drill more sensible to the hand pressure and with which it can measure the mill rotation with the maximum precision, without considering additionally that...it works all the time even without electricity! Once again we notice engravers, clamps and two pliers, and on the right the series of shears to cut the plate, of different sizes. The apprentice, that holds the empty spot at the table, is standing up and he's fusing, managing on the fire the melting pot. At his feet there is the blower, "bufat" in Valenzan, that is used to poke the fire, blowing air. In the corner fixed on a log, there is a small anvil, like today's, naturally. Certainly, now in the factories there are the power machines, there is the pressure die-casting, which is a technique already known from before the Renaissance - and for sure already in use by the Maya's - and that is an evolution of the lost wax casting, technology that is lost in the dawn of times. The mills are made of special steels, like the engravers. But before the gas was brought in the labs, the gold was welded with the "lurnèra" a small alcohol stove, which flame was directed by a blowpipe on the part to weld, exactly as four thousand years ago by the Ancient Egyptians. Furthermore, before the electrical illumination the lamp on the workbench was made of a sphere full of water (the globe), which projected the oil lamp light on the "stocco". The "garsunì" is casting, managing on the fire the melting pot.